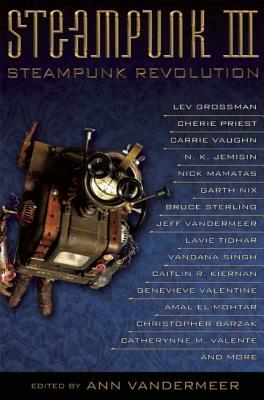 Steampunk Revolution features a renegade collective of writers and artists, including steampunk legends and hot, new talents rebooting the steam-driven past and powering it into the future. Lev Grossman's "Sir Ranulph Wykeham-Rackham, GBE, a.k.a. Roboticus the All-Knowing" is the Six-Million-Dollar Steampunk Man, possessing appendages and workings recycled from metal parts, yet also fully human, resilient, and determined. Bruce Sterling's "White Fungus" introduces steampunk's younger cousin, salvage-punk, speculating on how cities will be built in the future using preexisting materials. Cat Valente's "Mother Is a Machine" explores the merging of man and machine and a whole new form of parenting. In Jeff VanderMeer's anti-steampunk story "Fixing Hanover," a creator must turn his back on his creation because it is so utterly destructive. And Cherie Priest presents "The Clockroach," a new and very unsettling mode of transportation. Going far beyond corsets and goggles, Steampunk Revolution is not just your granddad's zeppelin--it's an even wilder ride. Ann VanderMeer is the Hugo Award-winning editor of Weird Fiction Review. She was the fiction editor at Weird Tales and the publisher of Buzzcity Press, work for which received the British Fantasy, International Horror Guild, and Rhysling awards. An expert on Victoriana, she is the co-editor of the bestselling World Fantasy Award-nominated Steampunk series. Her other anthologies include the Best American Fantasy and Leviathan series, The Thackery T. Lambshead Pocket Guide to Eccentric & Discredited Diseases, The New Weird, and Last Drink, Bird Head.